England played yet another thrilling encounter in the ICC Cricket World Cup 2011 on Sunday. England held its nerves against South Africa to win a nail-biting match by six runs at the MA Chidambaram Stadium in Chennai. After opting to bat England was bowled out for 171 in 45.3 overs. Barring a 99-run stand between Jonathan Trott (52: 94b, 3×4) and Ravi Bopara (60: 98b, 3×4, 1×6) none of the other England batsmen offered any resistance. 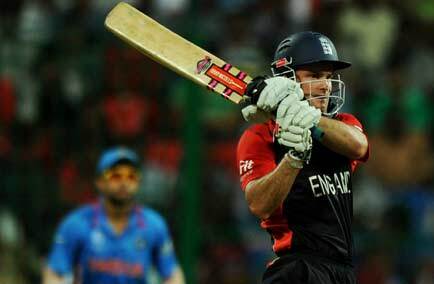 England started off disastrously losing both Andrew Strauss and Kevin Pietersen in the first over. For South Africa the best bowlers were left-arm spinner Robin Peterson (3-22) and leggie Imran Tahir (4-38). In its chase, South Africa appeared to be cruising at 124 for 3. But a middle-order collapse followed as South Africa slipped from 124 for 3 to 127 for 7. Only Hashim Amla (42) offered any hope at the top. Later a gritty eighth wicket stand of 33 between Morne van Wyk (13) and Dale Steyn (20) raised hopes as South Africa inched closer. But Stuart Broad with a spell of 4-15 came back in time to script a famous win. Of the other bowlers, James Anderson (2-16) and Graeme Swann (1-29) bowled good spells.